Another beautiful day in June, means another gorgeous Wedding day! This time it was Jannine & Adam’s Wedding which was held in the lovely village of Fotheringhay. The Church of Saint Mary’s and All Saints itself has really interesting history, with close links with Royality from the times of the Normans to the Stuarts. I would definately urge to you go and pay the village & church a visit, absolutely fascinating http://www.friends-of-fotheringhay-church.co.uk/history . With the happy couple being from a farming background it was sure to be a traditional day, mixed with Jimmy Choo shoes being the choice of the brides footwear (every girl should have a pair), to Vivienne Westward Jewellery & Wellington Boots!! The day started with bridal preparations at the Haycock Hotel in Wansford (another beautiful village), with the wedding taking place at Church of Saint Mary’s and All Saints Church, Fotheringhay. Unfortunately the Brides choice of transport to the church broke down, and like in most fairy tales, a knight in shining armour was passing by in a white stretch Mini (retro style) to save the day!!! 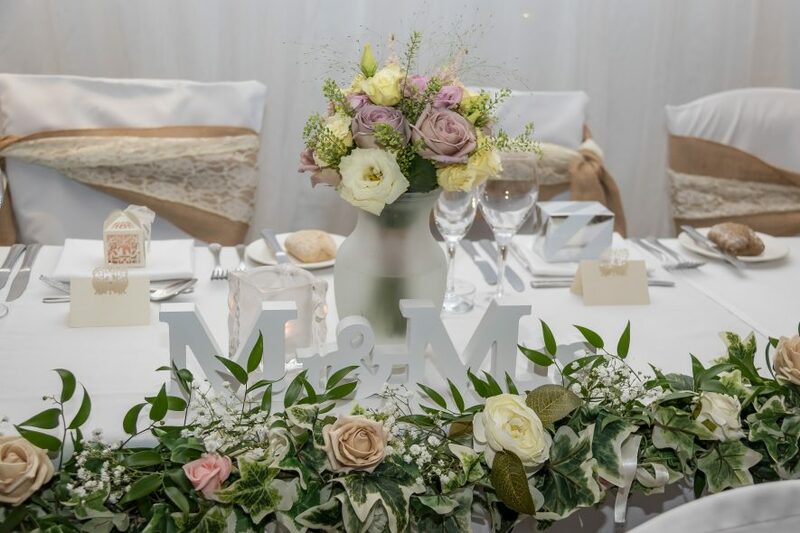 The Wedding Reception took place a short walk away in Fotheringhay Village Hall, with guests enjoying a Vintage Tea Party theme with the hall dec’d out with bunting and gorgeous flower arrangements by the lovely ladies at Rockingham Flowers, Kettering. The hall was then transformed into a dance floor and guests partied the night away, celebrating the marriage of two lovely people. A story the happy couple will be able to tell their children when they are older……..